▪ PREMIUM JAPANESE STEEL AND NON-STICK: Our high-quality Japanese VG10 super steel is protected by 67-layers high carbon stainless steel hand polished to a mirror finish from the spine to the razor sharp edge providing sharpness, anti corrosion, high ductility and hardness.Our “Tiny Wave” Damascus pattern not only looks beautiful, incorporating a hollow ground blade, but also provides a non-stick surface for smooth slicing! ▪ ERGONOMICALLY SHAPED HANDLE: The G-10 handle is made of a military grade composite that is highly impervious to heat and moisture and is exceptionally comfortable to hold. The shape encourages a pinch grip that allows more control over your slicing, dicing, and chopping. You can cut for hours without developing a sore hand. ▪ Worry-free 12-month warranty, 30-day no-hassle return & refund guarantee and life time technical support. The steel of blade was imported from Japan,but the polishing of blade and the processing of handle was completed in China. 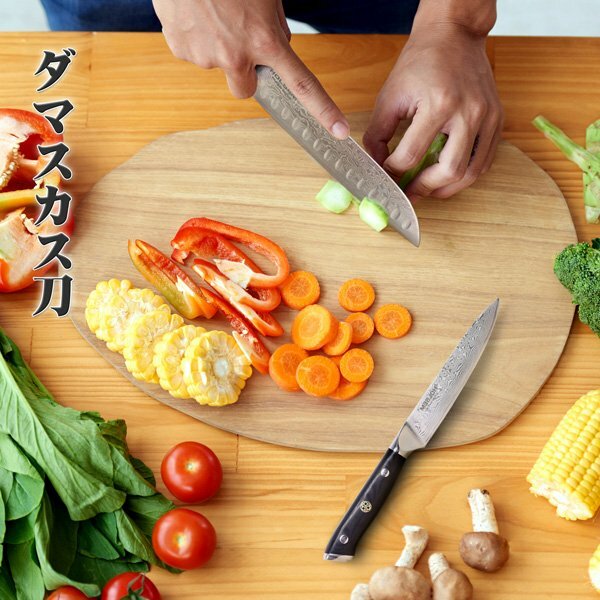 Our balanced design keeps the food being sliced perfectly and reduces fatigue when you slice the food for a long time.This chef knife can slice, dice, mince or chop in an easier and safer way. Full blade design allows maximum cutting capabilities - slice the entire length of the blade with gratifying efficiency.You can sharpen your knife easily - unlike the full bolster design which can be difficult to sharpen. 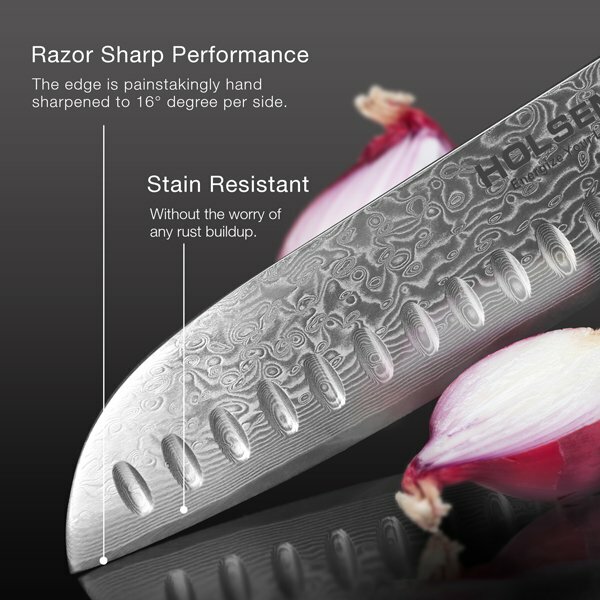 The seamless construction and smooth polished contours of the handle keep food from sticking to the blade. 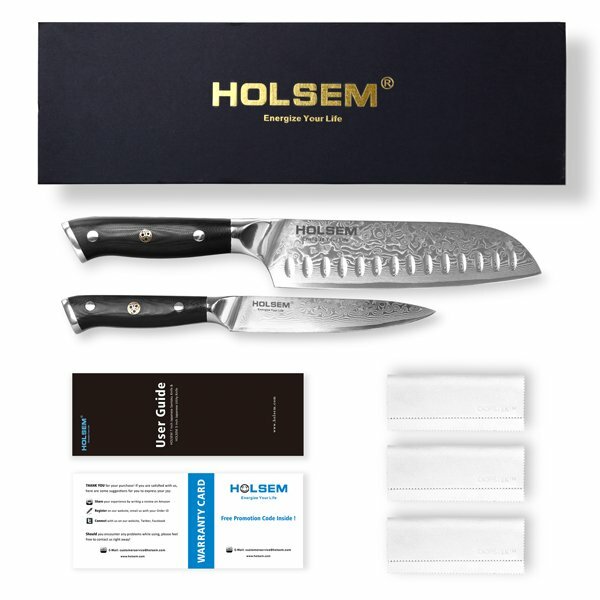 Classic hollow-ground grooves create a non-stick blade for slicing with buttery smoothness! You will feel the difference! 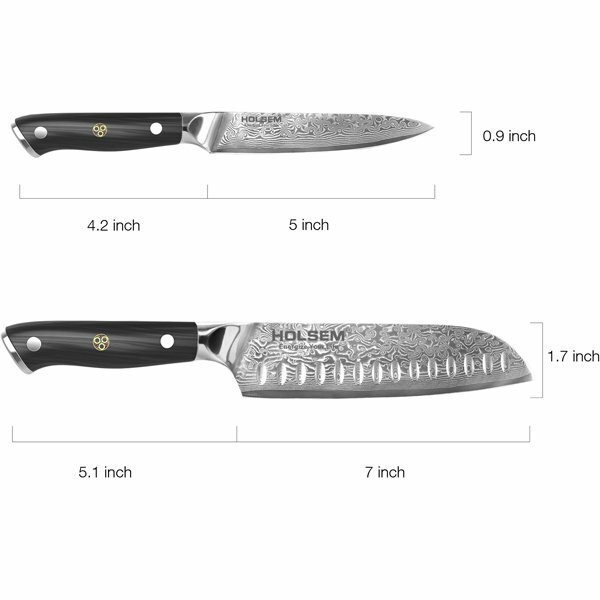 Classic 3-rivet design built around a solid full-tang high carbon stainless steel frame means your knife is strong, durable and perfectly balanced. After using knife, wash knife, then wipe it with a clean cloth and keep the knife in a dry circumstance.